Eddie Maddock focuses her Eye on Sedona to the plunder and destruction of El Rojo Grande Ranch in the profit versus preservation of Sedona’s ancient Indian artifacts and red rocks, irreplaceable bird and animal habitat, and possible sewage contamination of the Red Wall Limestone aquifer that supplies water to Sedona, Page Springs and surrounding communities when bulldozers arrive to clear pristine pre-settler land for 700 mobile homes and RV sites at the western gateway. Sedona AZ – Finally the election is OVER – DONE – KAPUT – FINIS! Some are rejoicing over the outcome, others are shedding tears, but if the truth were known, is anyone NOT celebrating the conclusion of this every two year event? That being said, what’s next on the agenda? Well, most assuredly a hot topic is reaching a boiling point regarding a pending change of zoning for El Rojo Grande Ranch to accommodate a massive 700 unit development at the outskirts west of Sedona City limits. Many of you have driven by the beautiful El Rojo Grande Ranch at the western gateway to Sedona yet you never have visited the Ranch. To you, and all our friends, this letter and website is for you! 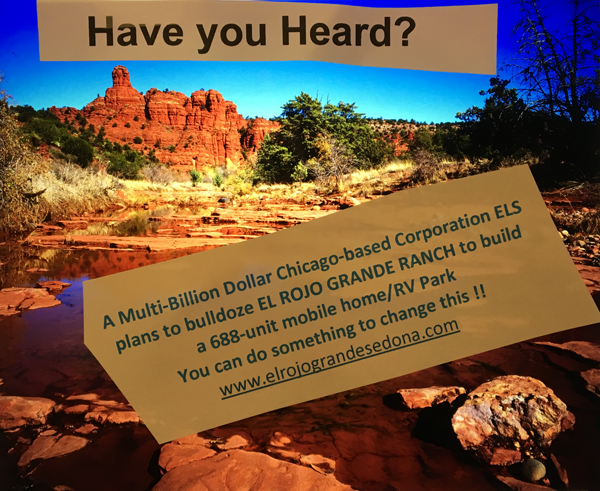 The buyer – a multi-billion-dollar based Chicago Corporation, Equity Lifestyles (ELS) and the owner of the Sedona Shadows mobile home park is asking Yavapai County to change the zoning of the ranch to allow them to build a huge 688-unit mobile home park (628 manufactured homes/apartments and a 60 RV Park) right next to the Dry Creek Scenic Road at the western gateway to Sedona. This website will take you on a tour of the Ranch, to see for yourself why it is so important for the Sedona Community to rally around the Ranch, as environmental stewards, and to block a zoning change that will allow the developer to bulldoze its ancient landscape, evict and destroy its rich wildlife and Indian artifacts, and leave it as a scarred example of the type of development that values profit over the preservation and conservation of the treasure that is El Rojo Grande Ranch. We are urgently asking for your immediate help to rally community support to block this PAD re-zoning, which will replace this priceless scenic wonder with a massive ocean of roofs. The fragile lands of El Rojo Grande Ranch will be forever harmed by pumping the water from beneath its riparian habitats to the development, and by dumping hundreds of thousands of gallons of effluent back into its creek bed each day, or by injecting that effluent into its underground aquifer. In addition to that tragedy, ELS will dispose huge amounts of surface runoff from their asphalt pavement into the riparian habitats. The wildlife and bird riparian habitats on El Rojo Grande Ranch will be drained and parched by the massive water pumping station proposed by ELS to supply its mobile home park. ELS has yet to propose a method for disposal of all that waste, which would contaminate the Red Wall Limestone aquifer that supplies water to Page Springs and its surrounding communities. Thanks to its past owners, most of the Ranch’s 173 acres are in the same pristine condition that early settlers in the Sedona area found it. It is still covered with ancient juniper trees, some of which are 200 years old – trees that were growing before the white man ever came into the Sedona area. It is truly a “step back in time”. Sadly, the beauty of the Ranch has been largely forgotten by those in the surrounding community. We invite you into this website www.elrojogradesedona.com to enjoy the photographs of its marvelous park, its wedding sites, its community gathering spots, and its equestrian facilities which was built on the 173 acres for the public to enjoy by riding on its beautiful acreage, and onto the beautiful Forest Service land that surrounds it. We invite you to read about the hundreds of species of birds, amphibians, reptiles, mammals, and plants that call its red rock and riparian habitat their home. In doing so, you will learn about the watershed, and the great riparian corridor in Northern Arizona which is currently under great stress, and in danger of being lost by the animals and plants who live here. To save the Ranch we must first make people in the Sedona area and all neighboring communities and our global friends aware of its existence, its beauty, and its potential contribution to Sedona, as a marvelous blessing for future of our residents and visitors to Sedona and the Northern Arizona region where Old West Dreams live on. El Rojo Grande Ranch was built to be a horse and cattle ranch. It was, nearly 26 years ago, built to be a working ranch surrounded on three sides by United States Forest Service lands – spectacular and welcoming to visitors from around the world. Please protect the land, and not allow an inappropriate development to proceed. Please do not allow El Rojo Grande Ranch to become a symbol of what unrestrained development can do in our internationally known center of natural beauty. By allowing this microcosm of Sedona to be bulldozed and turned into a sprawling ocean of mobile homes, we will be showing the entire world that our values of conservation and sustainability are only words – devoid of actions. The sellers have said themselves that this Ranch is magical! The International Sotheby’s has described this Ranch as pristine and magical! Let’s not let its magic be destroyed by bulldozers, and replaced by a sea of mobile home roofs. Please make this happen, and support – NO CHANGE IN ZONING! Write a letter today! Randy Garrison, Yavapai County Supervisor, is in change again of these proceedings along with the county commissioners and staff. Here is mine which you are welcome to cut and paste – click on this link. All letters are due by December 11, 2018. To the person who took time to read and then comment on my first comment @Freedy L(?) I wish to thank you. The reason my wife and I are vacation renters is because we wanted to test the waters to find out if Sedona would be a suitable place for retirement. Obviously based on our observations it is NOT and further, we will NOT be returning as tourists either nor will we recommend it to friends. Any more comments or questions? Sorry but the only ones who may give a darn or not if you ever come back to Sedona are all (or about 20) on SedonaEye. Oh you won’t be back? Bye bye…continue on with your exciting life worrying about wastewater while on vacation. Hi all, there has been a lot of clarification recently on issues. the Website http://www.elrojograndesedona.com is updated daily and we have only 7 days left for LETTERS and EMAILS !! Please skip the above conversations in this blog, for now, and go directly to the website – West Sedona and the Riparian Corridor of Dry Creek, part of the Arizona Protected Waterway and Dry Creek Scenic Road depends upon you all helping. 1. Impact on surrounding properties. 3. Conformance to development standards. 4. Maintaining the character of the neighborhood. 5. Preservation of safety and welfare. 6. Consistency with the comprehensive plan. 1. Personality of the applicant. 2. Questions concerning tech issues. 4. Financial gain or hardship. 6. Viability of the project. 8. CC&R requirements.”(What Are Covenants, Conditions, and Restrictions (CC&Rs)? The CC&Rs are the rules of your neighborhood. They describe the requirements and limitations about what you can do with your property. The goal of the CC&Rs is to protect, preserve, and enhance property values in the community. Most of the time, the rules make sense and are easy to accept. Imagine the Greater Sedona area as a giant body with the heart portion outlined by the Ranger Road, the “Y” and Schnebly Road roundabouts. Now imagine that the primary arteries of the heart are SR89a heading west, SR89a heading north and SR179 heading south. This area has been diagnosed with “congestive heart failure.” At many times during the day, at least one of these roundabouts is afflicted with major traffic congestion, either entering or leaving the Sedona area. Exacerbating the congestion problem are the various “blood clots” that are accumulating in all three of the arteries. To the south in the Village of Oak Creek, the Element hotel project located on the factory outlet site will be adding approximately 125 rooms. Directly to the south, the Hilton Garden Inn project is proposing approximately 175 rooms. To the north, the area in Oak Creek Canyon is being overwhelmed by industrial scale tourism. To the west, the Marriott Courtyard has opened 121 rooms and an additional 90 rooms were recently approved for a Residence Inn project next door to the Courtyard. 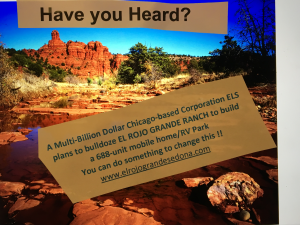 Unquestionably, the most impactful threat is the ELS corporation’s proposal of a 650-space manufactured home park that would be located 2.5 miles west of Sedona on the former 177 acre El Rojo Grande Ranch site. This property is located adjacent to the Sedona Pines/Shadows neighborhood. The future traffic impacts to Sedona are mind-boggling. This development is projected to increase the population that will be utilizing Sedona services by approximately 13%! So, what can we do? Obviously, there is no simple answer. We take one bite at a time, and the Sedona in Motion plan is a good start. We can also adamantly oppose some land trades/sales and developments that will have a detrimental impact on traffic congestion. In some cases, where zoning is already in place, developers have the right to build within the guidelines of the current zoning. In other cases, when a developer is seeking a zoning change that will increase density that will consequently make a significant contribution to traffic congestion, we can oppose the zone change. Such is the case with the proposed El Rojo Grande development. Even though this property is not within the Sedona city limits, residents of Yavapai County have a voice in zoning and land development decisions. 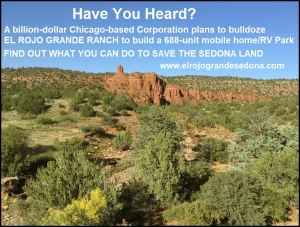 In my opinion, the proposed manufactured home development on the El Rojo Grande Ranch is a worst-case scenario for this pristine land, which is the western gateway to Sedona. Shockingly, the County does not appear to take the traffic impacts of this development on the City of Sedona as part of the criteria that they consider when making a decision on granting a zone change! A county official has stated that the primary consideration for granting the zone change will be the support or opposition of the adjacent neighbors to the development. This is your opportunity to get involved with preventing the “imminent heart attack” of traffic congestion. Go online and get educated about the issue at the ElRojoGrandeSedona.com website. Use the information in the letters on the website to contact the County Planning and Zoning Commissioners and Supervisors and voice your opposition. Letters should be sent to tammy.dewitt@yavapai.us. Show up at the meetings that are scheduled. Time is running out. @ERG A testimonial from former Mayor Rob Adams? The man who was responsible for putting in motion the vile no-bid advertising contract with the chamber when he was on City Council? IMO he has a helluva lot of nerve saying one word about development outside City Limits when he was one who glowed with pleasure when the deal was made with the Chamber & Lovely Jenn to promote only their members, most of whom are outside City Limits and don’t contribute to the municipality tax base. For that reason alone – no way no how – would we go against Yavapai County and the developer to seek zone change for yet another monster development. Only difference is this time it’s outside city limits. Because Rob Adams was a public figure at the time that the deal was made w/the chamber – there should be no reason for the Sedona Eye editor who likes to cover city staff and city council asses to delete his name. Please plan to attend this meeting. Because the YC wireless ordinance is no longer relevant and outdated , thanks in large part to our corporate loving Gov.Ducey and the wireless carrier mouthpiece, the FCC, Yavapai County Development Services no longer has written guidelines to enable the commisioners to make a qualified decision or recommendation. They are now unqualified to make a decision or recommendation to the Supervisors regarding wireless. Period. They must update the ordinance first. The present ordinances of Yavapai County regarding wireless communications are rarely enforced, if ever, no matter what non compliance item a resident brings to their attention. Existing structures, towers and antenna are not monitored for compliance ever. They have an ordinance for that too. It’s just a visual lip service, in my opinion. In my opinion, this new tower will be erected for smart meter and chipped items data collection for the benefit of the carrier. This will be done at the expense of public health and safety especially if it is 5g and so low to the ground. Keeping in mind, this height is more profitable for the carrier and it is all about them after all, in my opinion. In my opinion, ATT has always had an inferior product here for cell service after being in the cell phone business since 1996 and they could have cared less about your cell service or video games. I would recommend dropping ATT and using a more residential friendly service. There are studies which show a 30% increased chance of illness within 1500 feet of a tower, that includes cancer. That is on lower 3 and 4 g. 5g is more dangerous according to studies. This microwave radiation will enter these metal structures and bounce around thoughout the inside of the home and timeshare as well as coming in through the wiring system and the smart meter. I feel this is the most dangerous place the live and many residents are stuck there with rising lot fees and no way out. Attack the ordinance. Delay the decision. Still time to write letters( before Monday) and show up at the Dec. 20th P&Z meeting to give your comments. PLEASE PASS this info on to others on your email lists. This will benefit AT&T customers only! AT&T is back with a proposal to place an 80 foot tall cell tower, disguised as a broad leaf tree, in the parking lot between Red Moon Drive and Sedona Pines Resort office/ Bella Vita Restaurant. Sprint already has a cell tower inside the Tall Flagpole at Sedona Pines. Public comments will be taken at this meeting, but write your letters NOW! 1. No new wireless communication facilities within one thousand feet (1,000 ft) of any residences, including single and multiple family residences and residential facilities. 3. (A similar concern)No new wireless communication facilities shall be installed in any area that may mar mountain views, or visually sensitive areas. 5. A lesser preferred facility type may be permitted only if the applicant presents substantial evidence to show that it will have a lesser visual impact than the use of more preferred facilities. SO.stress that Yavapai County has Strong Regulations Already in place. What our County Officials must do is ENFORCE our Planning and Zoning Ordinance! Write your Letter today. Make it simple. Be sure to sign your letters with your Name and Address. It is VERY important that they know you Live nearby. No phone calls, they don’t count. 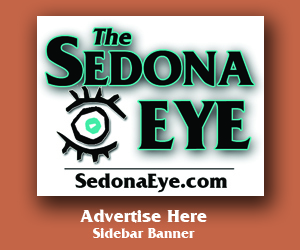 Dear folks on Sedona EYE. Thanks for all of you chiming in on the rezoning matter on El Rojo Grande Ranch. Though hundreds of letter have been received against the the rezoning matter – just a couple of supervisors or commissioners may be the catalyst that changes Sedona’s entrance from the west FOREVER. One of your writers said ” oh that’s the west entrance – what’s the big deal…” the BIG deal is that the work that is being done on Route #260 is being done in conjunction with these developers. The entry into Sedona will be channeled directly through Cottonwood. That’s your progress. So we have a chance now, to ask ELS to leave town, to not develop this Riparian Corridor – but we cannot do it without ALL of your help. We received this letter from Karin Offield yesterday – pls read and share – see you at the meetings, write the new letters – stand up and get out to say NO REZONING! “I believe El Rojo Grande Ranch lands deserves a better second life in Sedona’s rich history. El Rojo Grande is a neighbor to the iconic Bell Rock; Cathedral Rock; El Rojo Grande is the home of Walt Disney’s The Legend of Lobo Cave; the Indian artifacts and massive number of arrowheads found on the banks above the Arizona designated waterway Dry Creek; the sacred land of the Indians hunters and gatherers, and every where I looked I saw signs of wildlife, birds, small critters, wildflowers and the incredible and iconic Red Rock out -cropping. The Big Red. It’s famous and sits high above El Rojo Grande Ranch. Should the Yavapai County Commissioners and the P & Z listen to their county citizens, in the consul and consult of their letters and to the citizens recommendations about the county they live in and pay taxes to – we hope that the entire Board of Supervisors and the Commissioners of Planning & Zoning can be held responsive as representatives of the public i.e. : public servants for a change of zoning that will obviously violate the laws and the growth directions the citizens and governments already have put in place. Zoning changes should not benefit one developer alone nor should zoning changes be made that permit harm. Zoning laws are in place to protect our environment, protecting our few remaining riparian corridors in this area, our rights to protect our community services, our rights to live in peaceful enjoyment, our rights to drive on protected scenic highways and the zoning laws are in place to work with all the neighborhood’s rights to choose the direction they want for their town. In many aspects Sedona is in crisis right now, the timing of this development could not be worse. JUST SAY NO TO ALLOWING A REZONING. Here is a copy of my email to Yavapai County Development Services. Cut and paste what you like to help with your own letter. Anyone knowing people who might be interested in land preservation, please forward this letter and website. There has to be someone out there who would happily develop differently. Spread the word! Thanks. Here are several reasons that support my decision to oppose the zoning change that will enable the “scraping” of pristine land and destruction of wildlife habitat to cluster build a project that does not mesh with the area. Coconino National Forest and within that the Red Rock Country, an ADOT designated Historic State Road (89a) and an ADOT designated Scenic Road(Dry Creek). Dry Creek Scenic Road is from MP 363.5 to MP 370.0 or Page Springs to the Dry Creek Road. Supervisors Thurman and Garrison share portions of the Dry Creek Scenic Road according to the District maps. #2 Wildlife and environmental impact studies must be done before action. Migratory Bird Treaty Act of 1918. This supersedes just about everything. ESA=Endangered Species Act, LE=Listed Endangered, LT=Listed Threatened, PE=Proposed Endangered, C=Candidate. #3 Historic trails and visual intrusion. Check Historic Lime Kiln trail for example. Please go back to the drawing board on this one. It will be worth it. Become part of the reason why people chose to live here. I live here with likeminded people who value and coexist with nature, the environment and all that it includes. This includes the State and Federal Government. Thank you to the many neighbors who have cared and worked hard for all of us in the past so that we may continue the effort as present good stewards of the land. There are many ways to combine nature with business opportunities. Do a letter now, inaction is approval. Consider yourself DEBUNKED, Supervisor Clueless!!! “In terms of workforce housing, having 130 to 140 [people] dropped in your lap is a huge benefit to your community,” Garrison said in October. Sedona Red Rock news has 32 jobs, many duplicated which they do on a regular basis. Most jobs pay minimum wage, 10.50 up to 12.00 per hour.BEFORE TAX!! leaving 8,000 for the mortgage payment, tax and insurance, income tax, food, motor vehicle and lets not forget health insurance which these jobs do not provide. They may be eligible for Access. They will not get a loan with this income. That still leave no jobs for 100 potential new residents. No Supervisor Clueless. They will not be shopping or going out to eat or getting massages or taking art classes. Pick another angle and think before you speak. Do a little research. Most of this commission is from the other side of Mingus Mountain. They build willy nilly and are out of water there. No worries. They buy ranches on our side to pipe water to themselves. They don’t really care for our conservative views on nature but are happy to take our resources. They have our water in Cornville and Camp Verde from the redistricting(it was 2 against 1 then, Thurman and Springer against Davis). Do you remember the developers who built on either side of Oak Creek and closed it off in the loop area? They eventually went bankrupt? One of them is our commissioner. Scary. There are many indentured servants working for the County. Lawyers, builders, and failures all owing whatever the County wants from the Prescott side and that right now is MONEY from building with no regard of the land. And the cherry on the cupcake? Verde County is sounding better every day. Let’s do it. Go ahead with your Verde County if you must but keep those of us in the Coconino County side of Sedona out of it! PLEASE! Dear Sedona Eye Visitors, Thank you for continuing to follow this subject either on the FACE BOOK site Save El Rojo Grande Ranch, or on the website http://www.elrojograndesedona.com. 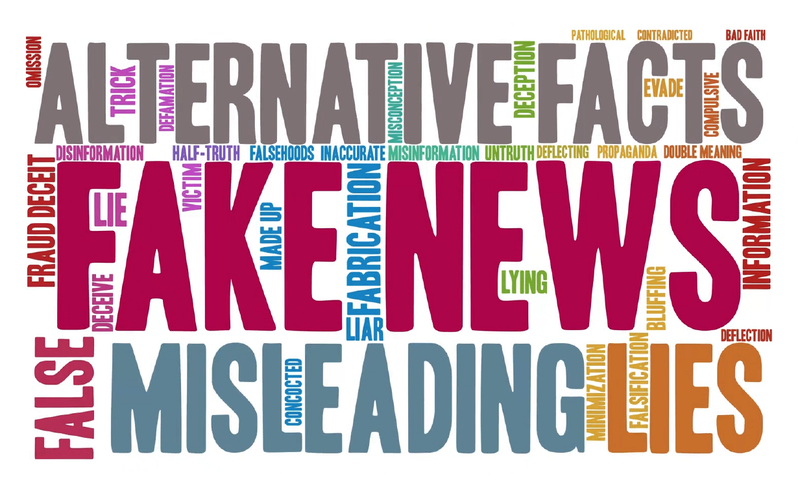 The meeting on December 20th was transcribed and is available under the FACTS tab on the website, the actual video of the meet may soon be found at http://www.yavapai.us/meetings/video-list. Also there was a radio broadcast of an interview with Randy Garrison on December 17th. That too is on the FB site and the website. The NEW DATE FOR LETTERS IS January 7th. Please, if you can send a letter in a RED envelope. If you have already written but want to add more, title it a supplementary letter and get it in. The meeting to attend is January 17th. We are very busy trying to organize speakers to represent the 2 minutes given to each citizen through the public process. We do have a question – we do not seem to be able to reach out directly to the P & Z Commissioners. The avenue they are sending us is to Tammy – is she part and parcel with the P & Z ? According to our understanding – every public body must have a means of public access. So when we are reaching Tammy are we talking to the P & Z who is the recommendation body to Randy and his 4 Supervisors? Send Emails or Letters saying that you are opposed to the rezoning, and give your reasons why. Note: Must be received before January 7th, 2018. Every opposition email or letter counts! Emails to: planning@yavapai.us Include your NAME and ADDRESS (Very important). Letters to: Attn: Planning Dept – Tammy DewittRe: El Rojo Grande Ranch, Yavapai County Development Services, 10 South 6th St. , Cottonwood, AZ 86326. The January 17th meet – please wear red. Dates and times on website. Send a letter yet everybody in Sedona ? I prefer media to publish the names of all letters received by the Yavapai supervisors and its government liaison and publish letters saying who supports and doesn’t support this project. Officials and citizens need to be on the record of supporting or not supporting this massive change to Sedona now. Let us see who votes for this project. Thank you for being the only media that cared. You should win more awards. RV rigs unwelcomed in Sedona. Follow the money. Those that supported candidates $$$$ get their way. Vote buying. Business hold it over their heads! Go look at who donated to who. That’s how they do it in Sedona. you don’t do anybody any good with your greedy money grab.Drving the cost of living up. The public shouldn’t be subsidizing BUSINESSES. (deleted by editor) Greedy cowporkers. You are full of misinformation now aren’t you!.. I have to agree with @@Follow the money. If the businesses – chamber were knocking business out of the park they wouldn’t be scrapping for the city to pay for their advertising. If you look at the chamber’s public tax returns it shows that the city pays the majority of their bills without any checks. Chamber pays out who they want to like events in the village, forest service and keep sedona beautiful. Since they kick money to businesses like the rr news do you think those groups don’t battle to keep the money flowing? I know they do. I would guess the chamber pays the RR news a pretty big amount to have all those weekly features. I’d bet money the chamber is the RR news biggest account or contract. Then the city would be the next one? Time to wake up Sedona. I love to see every penny accounted for. You are paying while the special interest groups are playing with taxpayers money. Sedona, worth seeing, not worth going to see. Too much traffic, too commercial. You make a lot of statements above that are only YOUR OPINION ALONE. You have been wrong in your opinions in the past and have very little creditility. On your quest to derail the much needed Forest Road bypass you publicily said that you spoke with “EVERY PROPERTY OWNER AND THAT NONE OF THEM WANTED OR WOULD USE THE ROAD” That was proven to be inacurate by the City of Sedona survey where it was found that 85% WOULD USE THE ROAD AND WELCOMED IT BEING BUILT. “If you look at the chamber’s public tax returns it shows that the city pays the majority of their bills without any checks”. Never heard of any such thing before. “Chamber pays out who they want to like events in the village, forest service and keep sedona beautiful”. FALSE! “Since they kick money to businesses like the rr news do you think those groups don’t battle to keep the money flowing” Your words are inflamitory and false! “I know they do”. I have already said before what you know and what is the truth are two different things. “I would guess the chamber pays the RR news a pretty big amount to have all those weekly features”. This is the only thing that you are saying tha ist the truth, YOU THINK. What you tell people isn’t always the truth. I would urge anyone who takes what Joan says as fact to think twice. Stopping the El Rojo Grande Ranch is critical and we need real facts not just “I would guess” comments. Let me officially inform you there is no survey that supports the statistics Come on Joan stated. As a resident of an effected area, provide it Come on Joan. Sign me, An Educated Professional not easily swayed by opinion. Nitwit, the Forest Road survey you mentioned was supposedly representative of ALL Uptown residents, not just those who live on Forest Road — sort of like the classic example of democracy, 2 wolves and a sheep voting on who’s for dinner. The McLean Meditation Institute’s administrative offices have moved from Sedona, Arizona to the Santa Barbara area. The new meditation center is in Montecito. Another Sedona institution lost to the new and unimproved Sedona. 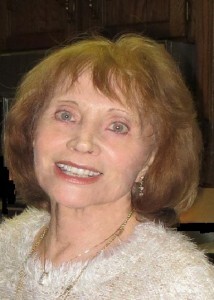 Sedona icon Sarah will be missed. Sad…Serving Sedona since 1993 the Takashi Japanese Restaurant said “Sayonara” and closed its doors late last year. It’s location on Jordan Road bordered the north side of the property the regional Chamber of Commerce purchased with $1,015,000 in City of Sedona public taxpayer money. JeanJ how great it is that you noticed that the Shirai family finally achieved their life’s goal and were able to retire while keeping their commercial property. While closing the doors of Takashi was a loss to my uptown neighbors and me, we are extremely happy that the Shirai family is now renting to the amazing Sedona Beer Company. May I recommend that you try the great local beer and juicy burgers. Thank you Kali Gajewski (Sedona born and raised) for investing in Sedona and building a great brewery in Uptown. JeanJ even you have to admit that by the city buying that property we will now (if the plans go through) have more parking so the workers can stop parking on Wilson, Smith and Van Deren. Let’s not forget that additional parking would improve property values for everyone in that area. Wow, A WIN WIN for all of us! Yes, and now the parking lot is open. It is now a city parking lot open to all, the chamber has agreement with city …to turn it over when paid off the bed tax is paying for it not locals. And new business in that spot Sedona Beer company. All good. Jean you know all this. 2018 was the best year in Sedona history for business…. Maybe the chamber will buy the Takashi location with city funds and pave it for another parking lot. JeanJ do you ever post anything supportive?? It seems to me that your posting above is taking a swipe at the city but I shouldn’t be surprised because that is all you and that women who lives on Wilson ever do. It appears to me that you should do more to help move this city forward instead of you always trying to hold the city back to the 1970’s. I agree with that post above from Know the Facts, Sedona Beer Company is a great improvement especially now that they are open for lunch. I’m not really a beer gal but I love their menu choices. Plus the wait staff and bartender are always so friendly. If the poster above is right and all of the employees that park in front of my house would be able to park in that lot, I say to the City, GET CRACKING AND START BUILDING!! I wonder if that new councilor Chisholm has something to do with making changes, he seems to like to listen to people. I live less than 1/2 mile from the former Takashi Japanese Restaurant and liked their food. My post is supportive. It’s absurd to lie and say I am trying to hold the City back. Last month I wrote a letter to the City Council supporting their recommended Forest Road Connection and received a nice comment from John Martinez. I voted YES that I would drive the connector. The AZAG’s office is looking into the City’s relationship with the Chamber of Commerce. The public taxpayer money the regional Chamber paid the City for the parking lot is one matter under investigation. Cool! Never mind that none of the people who actually own homes on Forest Road and who bought them with the rightful expectation of being able to enjoy the peace & quiet of a dead end street will have their property values and tranquility ruined. JeanJ wants to get to west Sedona a few minutes quicker. That’s the important thing. Me first! Right, JeanJ? The city likes to give commercial development permits without enough parking for employees, basically allowing over development of the properties. Then the city fixes things by building parking lots with taxpayer funds. It’s nice to know who the city works for. It’s sure not residents. The comment”rightful expectation of being able to enjoy the peace & quiet of a dead end street .” The streets are dead ends till they’re not, many people bought homes in Sedona next to national forest so they wouldn’t have neighbors are roads. There is Nothing in zoning saying that there could not be more homes or a road on Forest rd. Most homes in Sedona are built on through streets people on Forest will survive their values will not go down and It will be better for everybody in SEDONA to have a bypass from uptown it is for the greater good that is a socialist thing. It would be better for everybody of the city stopped giving the chamber 2.5 million a year. It is for the greater good. segner won’t be happy until Sedona looks like Bombay , which got so bad that since the wise city leaders could not make things better, they just changed the name to Mumbai. The City “Sedona in Motion” project indicates emergency usage as well as reducing traffic at the “Y” as reasons for the Forest Road Connection. The City came up with the Forest Road Connection idea. Uptown residents were surveyed to gauge usage data. 85% said they would use the extension. It’s moronic crap, lying and nuts to allege otherwise. Cones were used as a left turn lane closure on and off Jordan Road last year if heavy weekend traffic on 89A. And with six parking lots on or one block from Jordan Road, it’s impossible and unsafe for the vast majority of Uptown residents to use it except when non-busy. A lady named Rose said she drives through the Hyatt. By violating City codes, City government has grossly mismanaged and trashed the Jordan Character District and created health and safety problems. @Cool fact – where do you get your facts? Just curious, as I know first hand that no commercial projects are approved without sufficient parking in accordance with the Land Development Code. Then explain how Whole Foods got around that requirement because its parking lot and the adjacent commercial properties to that shopping area dont have adequate parking as dictated by land use requirements. It’s been a matter of contention before Whole Foods applied and was never enough to keep them responsible or out. Don’t feed us lines that it’s carved in Rock when Red Rocks can still be blasted. There has been a few, the wording is the details. Twisting details have allowed developers to go around codes. Allowing any development to pay or consent to use another business parking is how they get around it. Canyon Breeze bought city parking spots after Council women Graham declined the developers requested to use Sinagua Plaza. SP merchants leases prohibited it. There are many more if you look deeper. Appreciate knowledgeable response from someone about developers & details. That’s what this site offers & does it best. The hotel borrowed 69 parking spaces from the retail part of the outlet. It is already tight with only one restaurant open. When 2 more open where will people park? Who cares, that’s where. The County was all good with it. All good. You’re missing a critical detail, the city and county want you to use the mass transit, so they eliminate parking spaces. The little detail that there is no mass transit escapes them. Maybe the tourists will bicycle in, just like Holland. Or they will take the Metro, like Paris. They will bicycle in from Phoenix. Can you imagine, up the Black Canyon grade in 110 degree heat? This thread is not on topic. Letters are due on Monday, check out the website http://www.elrojograndesedona.com or Facebook Save El Rojo Grande Ranch. Thank you all for listening, contact us at elrojogranderanchinsedona@gmail.com for comments. @erg was given a gift by having the El Rojo land grievance publicized on Sedona Eye and also to have the ER website appear time and time again. Similar publicity such as in the RRN or other web sites would most likely have required extensive paid-for advertising. It seems you certainly had a bang for your buck on SE and why should disallowing others to air grievances be criticized? Their gripes are as legitimate as yours and don’t deserve being slammed, for which no doubt my opinion here will also place my head on your chopping block.